I have been a CBE Security Guard for 20 years. I'm grateful for the opportunity to greet our families and keep them safe each and every day. 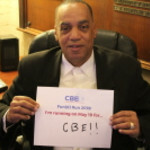 Support my CBE Fun(d) Run! If you donate $36 dollars your child will be entered to win Head of Security for the Morning with me. They'll take a spin in my chair, check the monitors, and most importantly, help me greet our families. And if one chance to win isn't enough, for a $100 donation, your child will have 5 chances to win!